If you’re a born again Christian, you are now completely different on the inside. In your spirit, you’ve died with Jesus and have been raised up to heavenly places just like Jesus. Your whole life is now different. However, the only way to get this new life on the inside of you to really change your world is to think like Jesus. The way to think like Jesus, is to keep your mind focused on what the Bible says about you. 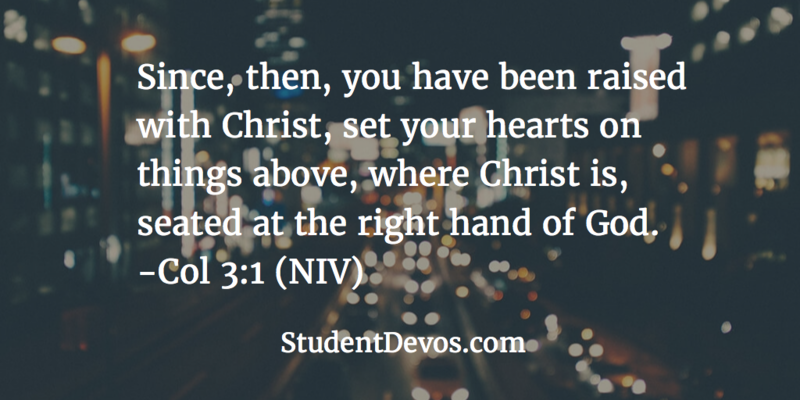 This is what it means when this verse says, “set your hearts on things above…”. How do you do this? You can go through the New Testament for starters, and look at all the instances where you see, “in Him”, “in Christ” or “by Whom”. Then you take those scriptures and believe that this is a reality in your new spirit inside you. The more you renew your mind to what the Bible says about you and then believe it, think on it and act like it, the more it will affect your life here on earth.